I already had the two "daughter" books on my TBR and have added The Latecomers - it sounds very good. Right now I'm enjoying "The White Mirror" by Elsa Hart, the second in the Li Du series, quiet, but compelling and I enjoy the bygone Asian setting. That sounds really appealing. I've been meaning to get into Elsa Hart's series. 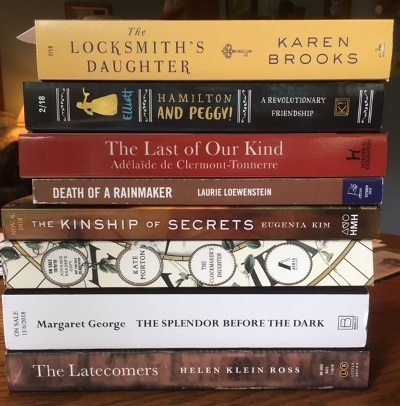 I have he CLockmaker's Daughter and The Latecomers already sitting on my shelf as well, and I'm really looking forward to reading them soon! I completely forgot about the second installment of Margaret George's Nero books--I definitely need to pick that up when it comes out. The Locksmith's Daughter has been on my radar as well, it sounds very interesting. Hope you enjoy these! The Nero books are a lot of fun. I'm about 50pp into the second book and enjoying his voice very much. Hope you enjoy the two that you have! I hadn't seen there was a new Kate Morton book - I'm ready for one! The Latecomers also looks like one I would enjoy. Thanks for the suggestions. Kate Morton's novel comes out in October. I want to get to it right away, but the only problem is there'll be a few years to wait for another, so I want to savor it! The Latecomers is one that showed up unexpectedly in the mail, and it looks like my type of book. Hope you enjoy both when you get the chance to read them! I read the first Nero book, looking forward to this second one. I started reading The Locksmiths Daughter but had trouble with it, had to lay it aside. It could've been my frame of mind at the time, I will give it another try. Sometimes books just don't work for some reason. I had some issues with her previous novel. The Brewers Tale? Yes! I had trouble with that too. Maybe she's just not my cup of tea as an author. Yes, that was the one. I finished it, but there were parts where I wasn't sure I wanted to. Currently reading The Locksmiths Daughter and love it. Once I accepted the premise of a woman spy in the 16th Century, I was all in. Learning lots of new vocabulary like "varlet." The new vocabulary made the book a lot of fun for me. Glad you're enjoying it! I started writing a review but set it aside when things got busy. I'll have to get it posted soon.